parties, cultural events and bands, plus concert line array system. $550 includes free delivery for two 18" subs and two 15" mids, as shown here. 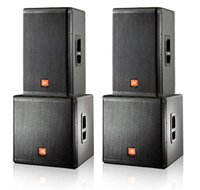 JBL MRX speakers and QSC 7 amps, 3,000 watts RMS or 6,000 peak. See it at a recent outdoor concert at Silvia Park. Includes free delivery set-up, sound check and collect in Auckland metro. To add microphones, a mixer and stage monitors see Individual Items. Get a quote here, or check out the links below to see some recent events. Equipment: We use a range of pro audio gear including JBL, Proel and Bose speakers, and QSC amps, Shure mics, Presonus, Mackie and Yamaha mixers. Extras: We can supply a PA system to any size to suit your event with complete front of house systems with full foldback, cordless mics, data projectors and screens, lighting, staging, marquees and power generators, and technical crew.